A girl can never have too much stationery. From note cards, to pretty envelopes and unique accoutrements, I have always loved pretty paper. Maybe that's why I like crafting with it so much! Today's project is a MIY--Make it Yourself idea! I created a cute mini stationery kit from SEI's Think of Me collection that is part of CLUB SEI's card making kit---yes, they have a monthly card making kit, scrapbooking kit and paper-crafting kit. Each kit is full of papers and embellishments, which are different from the main lines! How cool is that!? 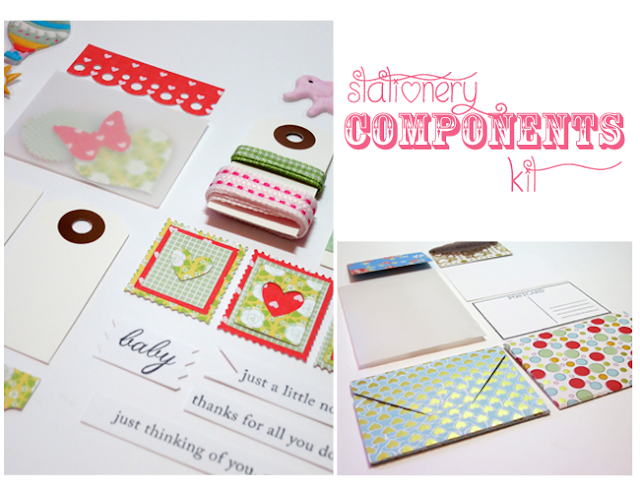 For a MIY mini card making kit, I have a few tips. First, make sure that you measure the cards you put in the kit, so they'll fit in the mini envelopes. Secondly, keep all your components to scale--make sure that all the little goodies will fit on their little cards. There are so many goodies that you can put in your kit, I'll share what I put in mine. 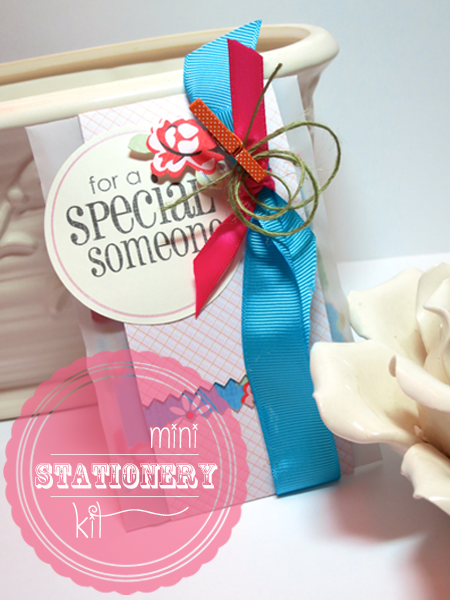 Because of the theme at this month's blog, stationery items like stamps, envelopes and a postcard take center stage! |Envelopes| There are two large envelopes and two small envelopes included in the kit. I die cut them from patterned paper found in CLUB SEI's card making kit. I picked patterned paper that was suitable for multiple occasions. |Stationery| Because there are two sizes of envelopes, I made two sizes of stationery. For the the larger envelopes, I trimmed two flat panel cards from cardstock. One panel is plain, and for the other, I stamped a postcard from Lawn Fawn's You've Got Mail set on it. Then I trimmed the postcard so it would in the large envelopes. The two smaller envelopes fit tags from Field Notes collection. Of course you could also use the tags separately, like attaching them to a gift bag. |Ribbon| I included two ribbon trims from CLUB SEI's card making kit. The green gingham and stitched pinked ribbon are suitable for any occasion, and are a suitable width for the smaller scale kit. I wrapped them around a tag, and secured them to the tag with double-stick tape. |Washi Tape| What kit would be complete without washi? You could use it as a border, or to adhere paper to paper, or even to secure a miniature envelope. Washi is the go-to embellishment for quick, easy and simple crafting. I trimmed two lengths of blue and green washi tape and wrapped them around a tiny tag (the same one I used for the stationery). |Embellishments| Inside a cute vellum envelope you'll find butterflies, heart and starburst circles that will liven up any card or tag. I punched them from the 8.5" x 11" paper pad that comes with CLUB SEI's card making kit. |Puffy Stickers| These are brand new and included in CLUB SEI's card making kit. They're teeny tiny, so they work perfect in your miniature card making kit. A little puff is so much fun to play with because it will add dimension to the cards and tags, but still fit in the envelopes. All I did was trim some from the sticker sheet, and add them to the kit. |Sentiment Flags| It's not as much fun if you have to write a sentiment on these adorable cards, so I stamped some general sentiments on cardstock using the Mat Stack 2 set from Papertrey Ink. After I stamped the sentiments trimmed the flags to create notched ends, and used pinking sheers for the cute deckled edge. |Patterned Paper strips| I love little strips of patterned paper color! So, I trimmed some patterned paper, and then created a decorative edge with a border punch. 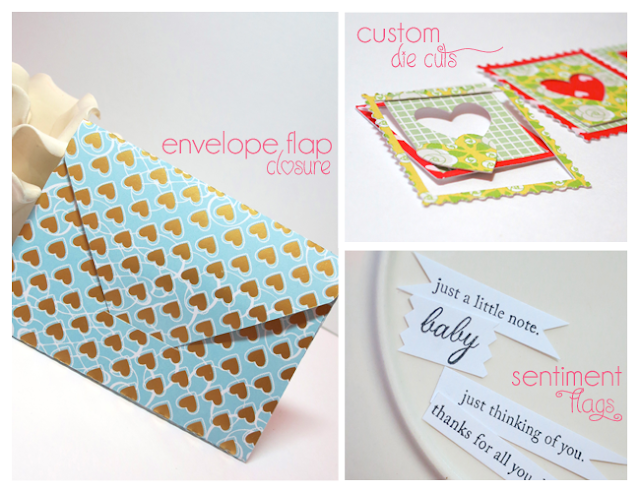 You could use the patterned paper strips to doll up the card or tag, or add some pizazz to the envelope. |Custom Die Cuts| These were so fun to make, and would look so cute on the envelopes! I die cut postage stamps from patterned paper, and all the pieces can be mixed up together to make the individual die cuts pop! So, how about I have a giveaway for this fun little kit? There are a few ways to win! I hope that you play along! Make sure to head over to Branch Out Designs fan page on Facebook, and click like. Come back and let me know that you did so, and receive an entry. After you have liked Branch Out Designs on Facebook, shared with your friends by tagging them on my page or shared this post on Facebook and Twitter, then comment below, and be entered in the giveaway. Share this post on Facebook or Twitter. Come back and let me know that you did so, and receive an entry. Giveaway closes on February 24th at midnite! This is so adorable and all the embellies are so cute!! Thanks so much! I am definitely a fan of embellishments! Love everything about this. Thanks for the giveaway! So adorable, I love this idea and know exactly who I would like to make these for, thanks so much for the inspiration and the chance to win one eeeeek! I have completed all of the above! Thanks so much for your sweet comment. I am so glad that you're inspired to make a kit yourself! So so cute, I am so going to make this. Thanks for the inspiration. You are so welcome! Thanks for stopping by and leaving a sweet comment. Don't forget to share a pic of your creation with me, I'd love to see your pretty creation!